The other day my sister Margaret and I were talking about our birthdays this month. If you have been reading my posts over the last few days then you know I’m having my 50th birthday this Friday and Margaret will be right behind me with her 48th on September 28th. 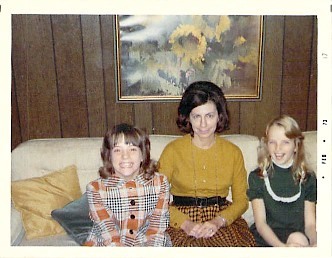 It almost doesn’t seem possible that both us are now significantly older than our step-mom Cullene was in this photograph. Sitting demurely between me at twelve and Margaret’s smiling ten year-old self, I am sure she had no idea the direction her life was about to take. She was a new bride in this photograph and at thirty-nine never expected that she would give birth to my youngest sister a little over a year later. It’s been 38 years since this picture was taken and several things strike me about this image. Margaret still laughs in the same way she did back then and I still smile large enough to see my back molars most of the time. I don’t think I ever noticed that Cullene is sitting in front of my favorite flower which as it turns out is Margaret’s favorite too. Two years after this photo was taken and not long after our birthdays in 1974, we were separated by bad circumstances for a ten-year period where celebrating our birthdays was not something we were able to share. In fact, the last time we had a chance to celebrate our birthday’s together in the same year, we were twelve and fourteen and let’s just say right now that 36 years later, we plan to make up for all of those missed birthdays. We are off to London in a few minutes to spend the next week celebrating the chance to see more of the world together along with sharing a room … something we haven’t down since we were about as old as we are in the photograph above. Watch out London!